Harlem RBI is a community-based youth development organization located in East Harlem providing year-round after-school, summer, and school-day programs that serve more than 1,200 East Harlem boys and girls, ages 5-25. All programs are unscreened and free of charge to participants. In 2008, Harlem RBI opened DREAM Charter School to deepen its impact in the community. 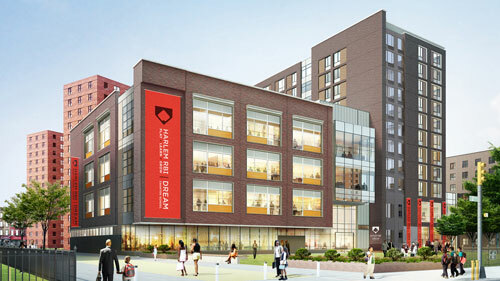 Harlem RBI/DREAM approached NCIF to participate in the financing of a new development that would include a school facility for DREAM, a new headquarters for Harlem RBI and 89 units of affordable housing. DREAM Charter School opened in 2008 with 50 kindergarteners and 50 first graders and reached full capacity of 450 students in grades K-8 in Fall 2015. The school's mission is to prepare students for high-performing high schools, colleges and beyond through a rigorous academic program that develops critical thinkers who demonstrate a love of learning, strong character, and a commitment to wellness and active citizenship. The DREAM Charter School Promise includes 1) high expectations for all students; 2) individualized attention, with two teachers in every classroom; 3) an extended school day and a 12-month school year; and 4) a focus on physical education, nutrition and health along with arts, music and dance for all students. Both CDFI and Minority Bank partners in the project, Carver Federal Savings Bank and City National Bank of New Jersey, benefit by originating a loan to this project. These loans provided revenue-generating business for the banks, and also helped them cement an ongoing relationship with Harlem RBI and DREAM.